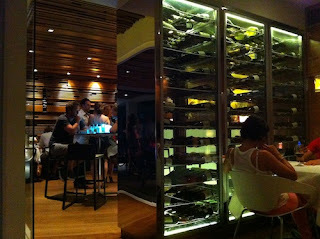 The Frenchman's Food & Wine Blog: Ricky's, Noosa Heads, Queensland: truly exceeds expectations! Ricky's, Noosa Heads, Queensland: truly exceeds expectations! I had the opportunity to stay at Clive Palmer's Palmer Coolum Resort (in the news earlier this year owing to its difficult transition and name changes from the Hyatt Coolum Resort to its present-day moniker; as well as the high profile political and other activities of its eponymous billionaire owner, who is building the Titanic II because he can) over the weekend for a conference, and decided to head up to Noosa for a night outside the resort with various friends and colleagues, including Suze, Kimmie, Phil, Sandra (well done ACLA Government Lawyer of the Year! ), Gillian, Adrian and others. Suze and I had an ulterior objective: to get fellow foodie Kimmie (who steadfastly does the job of two people without complaint and travels virtually every month) out and about and enjoying herself, instead of staying in her resort room doing more work, so we had to create a compelling lure by finding a good restaurant. 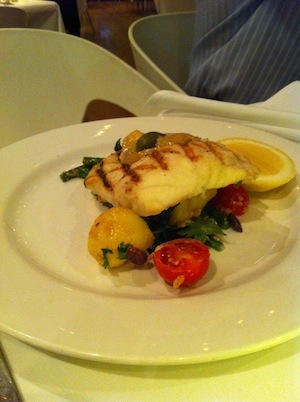 Some internet research suggested that Ricky's by the Noosa riverfront is the place to go - thank you to www.tripadvisor.com.au, one of the most reliable open-sourcing review websites I have found, based on my culinary travels around the world - so I booked a table there for me and my companions. This choice was further vindicated by Kate, a Sydney-sider I met at the resort, who told me that her boss, the managing director of a healthcare group with a hospital in this neck of the woods, rates Ricky's as his go-to restaurant whenever he makes a local visit. 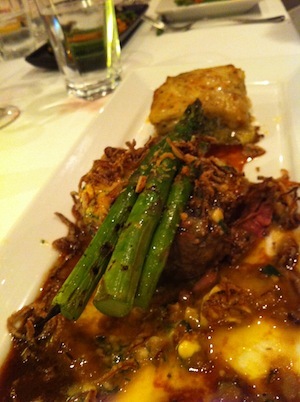 The best vindication, of course, is in the dining experience itself. The place was completely full when we turned up, with the tables turning over at least once, if not twice, during the course of the evening. 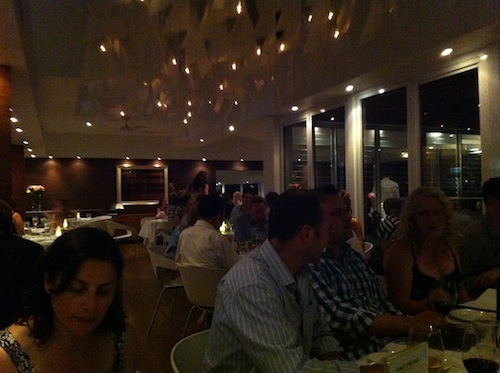 The decor was smart, modern and glitzy, all stone, wood and chrome - it's a Queensland seaside town, after all! There was also a smart and spacious bar area where diners waiting for their table would sit and have a few drinks while they waited. Good thing we booked well in advance. The service was attentive, friendly and very efficient. While the serving staff did not hover around annoyingly (which happens in some restaurants), and even though the place was seriously busy, we never had any trouble getting the attention of someone to meet our needs (usually for a fresh bottle of wine). When we left the restaurant, there were staff (including Daniel, who was serving our table) waiting by the exit to thank us and say good bye, which is a very nice touch indeed. 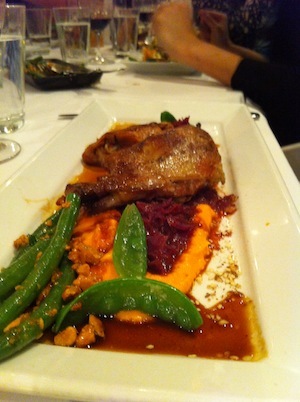 The menu provided ample variety, with entrees and mains focusing on comfort styles. The food was tasty and well executed, with steaks coming out medium rare when you asked for medium rare, with some care and effort going into the presentation of the dishes (tending to larger portions and full plates). The octopus that came with the octopus and pork belly entree was amazingly soft and light; soufflé-like in texture! The desserts impressed me - while there was a lag between ordering the desserts and receiving them, this was because they were prepared from scratch, including a perfect soufflé. The wine list was truly a standout for a restaurant in a holiday town. I was enthralled by the selection of wines - far larger than expected (most restaurants in this part of the world tend to give you only 5 or 6 wines to choose from, usually decided by their wine rep). But Ricky's wine list was impressive, even by Melbourne or Perth standards; going so far as to include a selection of Domaine de la Romanee Conti at $1,950 a bottle! 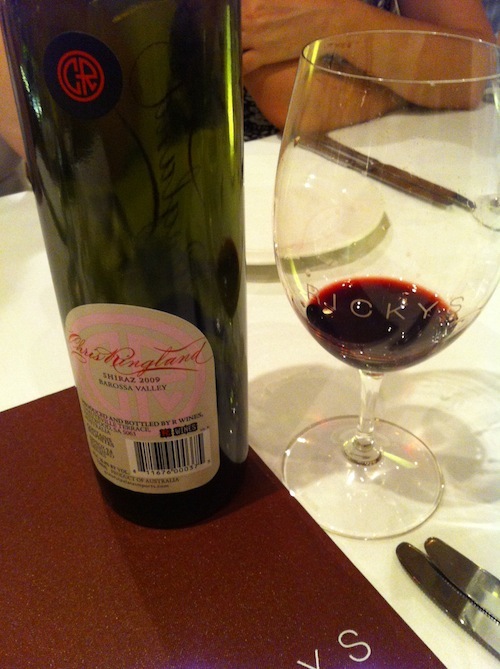 I chose the Chris Ringland Shiraz. Not the outrageously rare and pricey super-wine Three Rivers, but the $48 a bottle 2009 CR Shiraz, from the Barossa Valley. Speaking of pricing, this dinner only cost us around $75 a head excluding the wines, for 3 courses and liberal orders of side salads and greens. The Chris Ringland CR Shiraz was truly exquisite - rich and juicy spiced cherry, well balanced by fine tannins, it was so delicious that we ordered bottle after bottle, not realising how much we were drinking until it was too late to worry about it ... good thing we weren't driving! 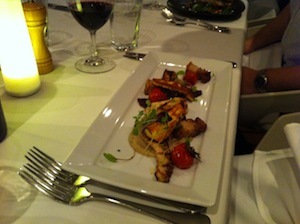 So if you're ever on the Queensland's Sunshine Coast, make sure you book a table at Ricky's. Who knows, you might even bump into Laura Anne and her friends!